Look for email confirmation of your purchase. If you are not able to attend in person, we encourage our community across the United States to watch the livestream during the event on Facebook. One case at a time, we are protecting and empowering victims of violence. Thank you for your support! Cristosal is a 501(c)(3) nonprofit organization working to advance human rights in Central America. As the leading organization providing protection and legal support to families displaced by violence, they provide humanitarian support and impact litigation services for current and past victims of human rights violations. Their recent work includes providing legal representation to the victims of the 1981 El Mozote Massacre in El Salvador. Cristosal has been recognized by the United Nations, the World Humanitarian Summit, the U.S. Department of State, and the Inter-American Human Rights Commission for its groundbreaking work. Massachusetts Congressman James P. McGovern has advocated for the protection and advancement of human rights in Central America for over three decades. In 2016, McGovern co-authored the Global Magnitsky Human Rights Accountability Act, which grants the U.S. President power to deny visas to human rights violators. He holds an honorary degree in human rights from the University of Central America. McGovern has traveled to El Salvador many times since the early 1980s. In 1983, his experiences in the country were instrumental in Congress's decision to cut aid to the Salvadoran army. In 2009, McGovern traveled to El Salvador to honor the memory of six Jesuit priests, their housekeeper, and her daughter who were killed by the US-trained Salvadoran army. Earlier this year, McGovern attended the Forced Disappearance During the Salvadoran Armed Conflict forum at the University of Central America. At that event, he called for the release of classified U.S. documents on the Salvadoran Civil War, noting that "much has been accomplished by the Salvadoran people in the past 25 years – but so very much is left to do." 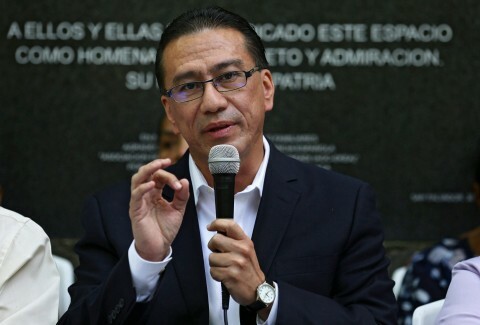 David Morales is the Human Rights Director for Cristosal, and the chief prosecutor in the El Mozote case. Morales has 25 years of experience as a human rights lawyer. Last fall, he helped expand Cristosal's Observatory on Forced Displacement by Violence into Guatemala and Honduras. Morales was the Ombudsman for Human Rights in El Salvador from 2013 to 2016. Thanks to his leadership, the Ombudsman’s office worked closely with Cristosal to release the first government report recognizing forced displacement by violence. He continues to encourage the Salvadoran government to establish policies and procedures for victims of violence through his work with Cristosal. "Civil society and our organizations can offer support to victims," Morales says, "but in the end it is the state that needs to assume this role. "Cristosal has taken on the task of changing public policies so that the state takes up the responsibility to defend the human rights of victims of violence. My dream would be that the state eventually fulfills its obligations to families; that they fulfill their responsibilities in a way that truly assists and protects victims that have been abandoned." Organizers with signs reading "El Mozote, Never Again"
Seeking justice for historic war crimes is essential to the struggle against the culture of impunity in contemporary El Salvador. In December 1981, soldiers from the Salvadoran Army massacred more than 1,000 people, including many children, in the village of El Mozote, Morazan. A post-war amnesty law blocked justice for victims and their families. In 2016, the Supreme Court of El Salvador overturned this law, reopening the possibility to seek justice. On March 29, eighteen Salvadoran military officers were arraigned at a court in the department of Morazan for the massacre in El Mozote. Cristosal’s Human Rights Director, David Morales, is representing victims and their families. For more information, contact boston@cristosal.org.